Photo by Blend Images - Inti St Clair. Courtesy of Getty Images. With Georgia’s infamous summer heat and humidity, it’s no surprise days are spent at area lakes, pools and water parks. But when you just want a quick cool down, head to one of the city’s interactive fountains where your kids can run through the timed fountains and splash around the welcome cool mists, many of which are located near Atlanta’s many green spaces. Click through the slideshow for a list of the best splash fountains and spraygrounds in Atlanta. Story by Tiffany Jaquins. Our Atlanta expertl, Kate Parham Kordsmeier, can be reached on twitter @KPKords or via email at kpkords@gmail.com. Photo courtesy of Paulding Chamber of Commerce. 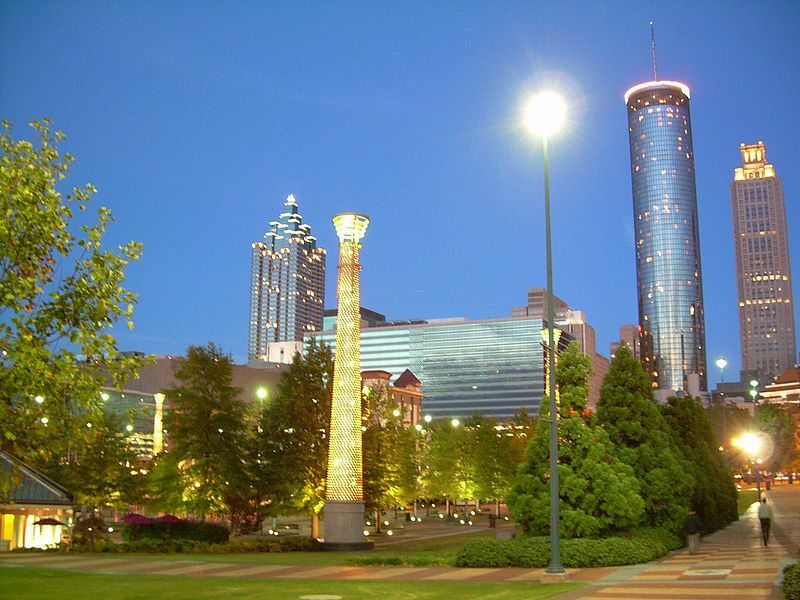 Spend some time at one of the most popular, central and iconic splash fountains in Atlanta. The Fountain of Rings show runs 4 times a day, 365 days a year at 12:30 p.m., 3:30 p.m., 6:30 p.m. and 9 p.m. The show is free to watch—plus, timing when to run in and out of the rings is a fun game of chance. Bring along a picnic basket and enjoy your lunch on the lawn at Centennial Olympic Park. Piedmont Park is not only home to stunning views of the city, but also Legacy Fountain in the Promenade at Piedmont Park. With more than 70 jets that reach up to 30 feet in the air, the fountain is the perfect place for kids to cool down after spending an afternoon in one of Atlanta’s most visited parks. Be sure to check out the fountain at night, when the special LED-lights will showcase more than 1 million different lighting arrangements. Photo courtesy of Wood+Partners, Inc. Hang out along the Atlanta BeltLine Eastside Trail and spend an afternoon at Historic Fourth Ward Park’s splash pad in one of the city's best parks. With water jets streaming from the ground and overhead, your kids are sure to be cooled off and have a great time on the pad’s ample play space. The park also has a skate park and plenty of charming landscaped greenery. Photo courtesy of the Atlanta BeltLine. 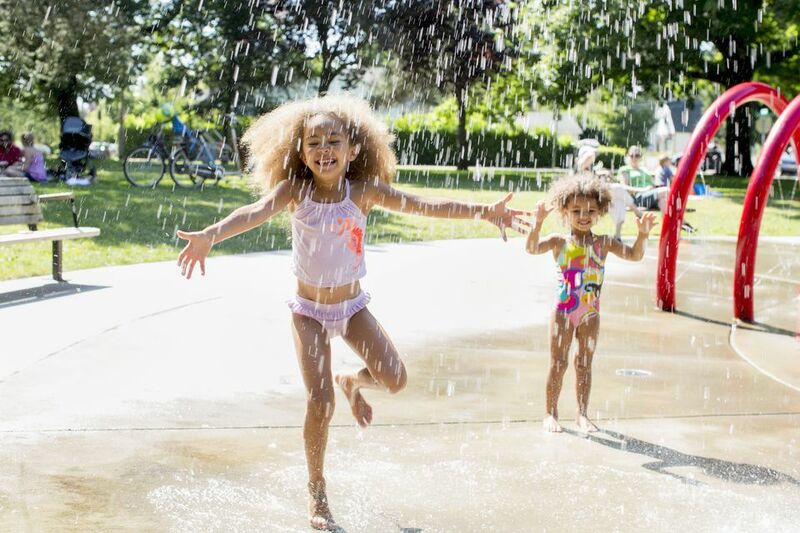 After spending an afternoon playing in Atlanta’s first energy-cost neutral park, make a welcomed escape from the summer heat in the D.H. Stanton Park Splash ‘N Play. This splash pad is home to a commissioned piece of public art by Robert Witherspoon at its center. Visit the dynamic splash fountain from 10:00 a.m. to 8:00 p.m. May 1 to October 1 each year. With fountains of water blasting from the ground, you’ll have plenty of fun playing in the water at Perkerson Park’s splash pad. Open from 10:00 a.m. to 8:00 p.m. every day from May 1 to October 1, you’ll have plenty of time to play in the park’s 18-hole disc golf course before enjoying the splash ground. Photo by Photo and Co. Courtesy of Getty Images. The sprayground at Center Hill Park was the first built in Atlanta outside of the Fountain of Rings at Centennial Olympic Park. Sit on the many benches surrounding the sprayground while watching your kids cool off with the many jets and misters at the park. They will love running through the tunnel created by many of the jets. All of the water used in the splash pad comes from the ground, creating a flat surface for kids to run around on. Located in the center of Duluth’s Town Green, the public fountain serves both as a centerpiece for the downtown community and a great place for kids to enjoy the cool water while spending a hot day outside. Check the city’s website to see what concerts, festivals, movies and other special events will be going on during your visit. Photo courtesy of Katie Phillips Fine Art. Over 1,400 gallons of water are recycled and run through the Big Splash Fountain in Suwanee’s Town Center Park each minute. With 43 water jets, playing in this splash pad is a great way to cool off and take a break during the afternoon. The fountain is open from 9:30 a.m. to 9:30 p.m. April 1 to October 31. Location: Town Center Park at the intersection of Lawrenceville-Suwanee Road and Buford Highway. Holding residence at Mall of Georgia’s fun-filled village area, the Village Pavilion Fountain is the perfect place to let your kids take a break when they tire of shopping. The interactive fountain is simple, with water shooting out of jets at different heights and splash intervals. Before you go, grab a bite to eat at one of the nearby restaurants and check out the mall’s lineup of special events going on to top of your day shopping at Georgia’s largest mall.